#1 Worldwide Leader in Magickal Technology !!! Now you can have all the magical power you want !!! With this exciting test you can get the evidence that you wanted !!! Action at a Distance is a characteristic of life force, and as such it has been known to humankind since the dawn of its existence. In fact, humans naturally have made extensive use of this potential of life force: Just think of the many forms of healing at a distance, shamanism, extra sensory perception and projection, clair voyance and, more recently, radionics. In the following, you can experience that which many persons who are all too entrenched in dogmatic pop-scientific prejudices consider sheer impossible. 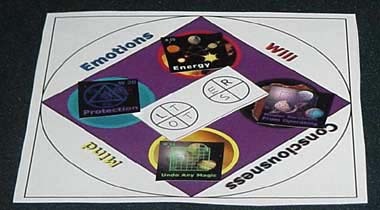 In fact, this experience of life energy transfer can well be the turning point in the way you are perceiving your surroundings in particular and the universe in general. You can also see this experience as a turning point in the way you are dealing with life and destiny: Now you can have the evidence that you are at the very threshhold to a new outlook on life, in which you can take control of relationships, money, profession, business, energy and life itself. To feel life force at a distance is extremely easy! Print out the diagram to your left. 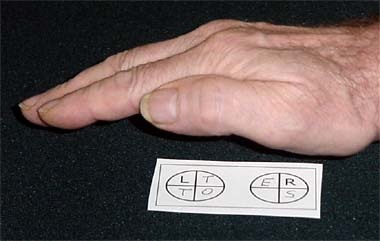 Hold the center of your palm 2 - 4 inches above the printed diagram. Make sure the hand is relaxed. Almost immediately you will feel something: either a gentle warmth (65% of the persons performing this test), a slight cool breeze (25%), or a tingling (5%). Some people feel combinations of tingling and warmth or cool breeze and tingling. You feel life force, because an identical diagram is next to one of our Chi Generators in our labortatory. Since the identical diagrams act as structural links, you can consciously draw life force from this generator. 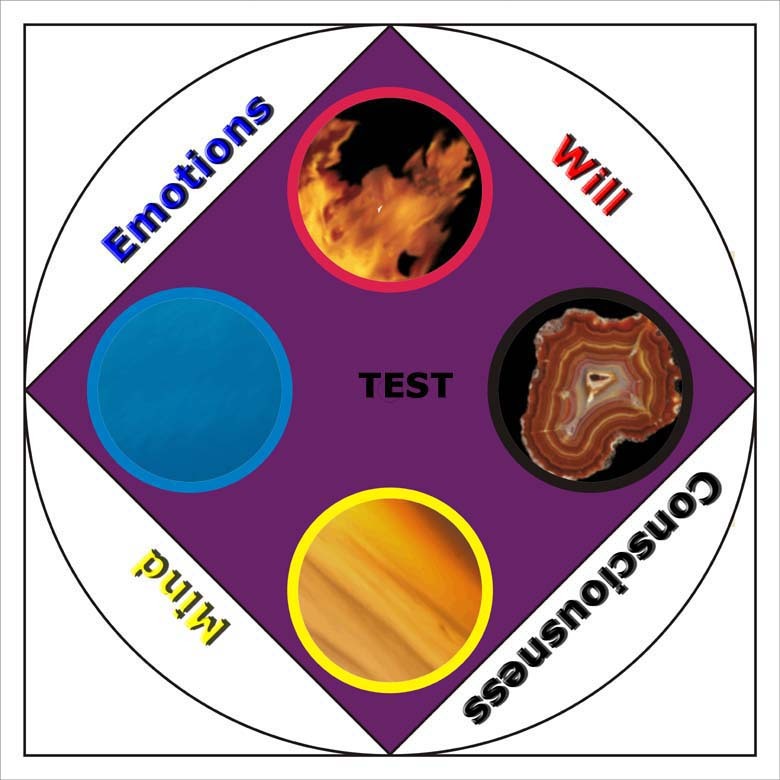 What you are feeling in this exciting test is raw and unmodified life force, while in your work with Astro-Dynamic Manifestation, you can send modified life force into the various areas of your house, office, and, most importantly, to yourself. In fact, this is the principle of the life force technology, that we have mentioned above, and which has been used by healers, shamans, priests and psychics since the dawn of humankind, and it has always helped them to manifest the effects that they desired. Our scientific approach combined with the generator of life force makes this work much easier for you and much more effective than can be done by any professional practitioner or group of practitioners who limit themselves to the more traditional methods. In fact, with this exciting new technology, traditional methods became obsolete: As obsolete as a good pair of shoes versus a plane ticket when you want to travel from San Francisco to New York. And now, you can get better and highly interesting results when you print out the diagrams below, call us or any one of our distributors for an individualized transfer of life force. 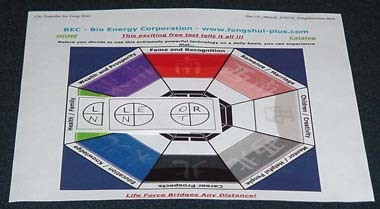 (2) Cut out transfer diagrams, the circle with the four elements and sample cards of the "Alphabet of Success." (3) Take the transfer diagrams and call us for your 24-hour test. To make your diagrams unique, we will tell you letters and the sectors where to inscribe them on all three diagrams. 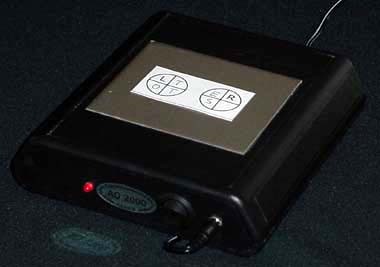 (4) We will put the individualized diagram with the same incribed letters onto a Chi Generator®. By now, your diagram is connected to this Chi Generator® and it will be connected for a full 24 hours. Now you can proceed on your own. (5) At first, test one of your diagrams for energy output: Hold the center of your palm 2 - 4 inches above the printed diagram. Make sure the hand is relaxed. Almost immediately you will feel something: either a gentle warmth, a slight cool breeze, or a tingling. Some people feel combinations of tingling and warmth or cool breeze and tingling. 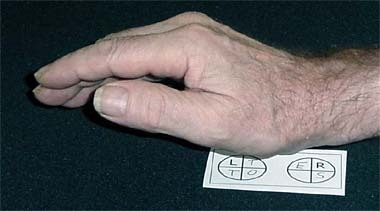 (6) As an alternative, hold your wrist above the transfer diagram. To fully supercharge yourself with energy, simply carry this transfer diagram on yourself for 20-30 minutes. 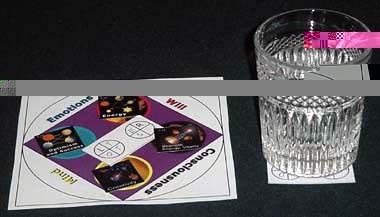 (7) This is a setup for success, in which you are using the four elements and cards that you printed out. Put the transfer in the center and supercharge yourself with energy, with new ideas, with creativity and a positive attitude towards success in general. 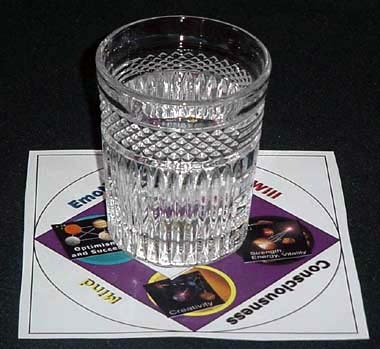 (8) Here you use the same setup and charge drinking water with this energy for success, transforming the water in a success-drink that is supercharged with life energy. Of course, you can also charge food, supplements and any other beverages with this energy. For pure optimizing of water and super-charging it with life force, see www.livingchiwater.com. (9) In this example you transfer this energy for success to yourself at any distance: Put one of the transfers into the center of the circle and carry the other transfer on yourself. (10) Finally, this shows how you can super-charge water at a distance with any energy that you custom-design. In this case you are using the element-disk with symbols of the Alphabet of Success. (11) Here is a setup for meditation and to develop ESP and other skills of the mind. 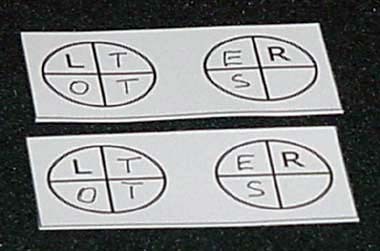 Again you put the one of the transfers in the center of the circle while you are carrying the other transfer on yourself. (12) This is a design for protection against negativity or magical attacks. Again, you can charge an area with this energy or you can carry the other transfer with yourself, or both. (10) Here a setup for body building , using the card for muscle strength and vitality. With the second transfer on yoursenf, you can transfer the sports energy at any distance and you can charge water for this purpose. (11) This setup is for weight control: fat burning and counteracting junk food advertising. An ideal life energy charge for slim-down drinks! 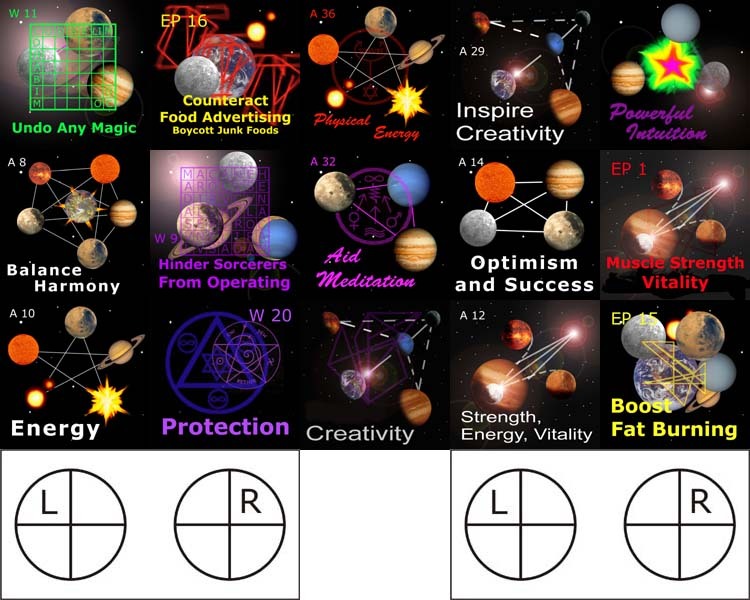 (8) Here is an astrological setup for sports. 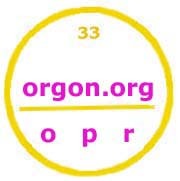 For more information about astrology, see www.astroboost.com and download the astrological symbols. You can find additional information about Chi energy and sports in www.eliteboost.com. And now have fun with your Transfer Test !! !